For Professional Camcorders up to 23"
The Porta Brace CO-PC Carry-On Camcorder Case (Black) is a compact, lightweight 1000 denier waterproofed Cordura nylon case with extra thick foam side walls, padded with a pillowing system. 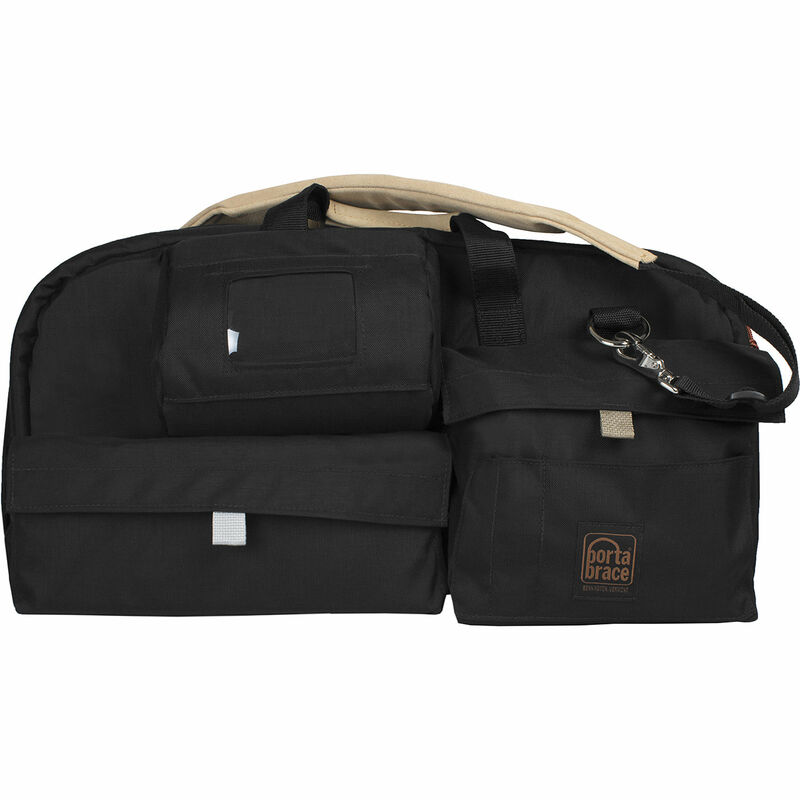 It is designed to organize and protect a professional/Broadcast video camera/camcorder up to 23" long. The case has a built-in reinforced viewfinder protector and exterior pockets for accessories. The case is carried by suede leather-covered hand grips or a removable, adjustable shoulder strap with suede leather-covered pad. This Porta Brace case is made in Vermont, USA. Box Dimensions (LxWxH) 25.0 x 14.0 x 7.0"
CO-PC Carry-On Camcorder Case (Black) is rated 4.4 out of 5 by 11. Rated 4 out of 5 by Garrus74 from Nice sturdy bag for a professional cam I bought this to use with my Sony HVR-S270U. First of all, the camera fits nicely, there's room for a spare battery inside the bag; I like the cushion for the lens, the nonslip surface inside the bag, and the stiff side compartment which protects the rail with the lcd, even if extended a good bit. There're also ample pockets on the side. The fabric seems durable, but time will tell. It's a little on the bulky side, but overall a great bag for traveling. The only con: it's troublesome (sometimes impossible) to fit it in the overhead bin depending on the plane. Rated 4 out of 5 by Edit One from Not for EX3 We ordered this because it was, at the time, the closest PortaBrace unit for the new Sony EX3 camera. Unfortunately it does not fit as well as hoped and we have used a Petrol bag instead and this unit has been used for other equipment.The build quality is the usual reliable PortaBrace quality and I would always recommend PortaBrace. I think a unit specifically designed for the EX3 is now available from PortaBrace. Rated 5 out of 5 by Webb Pickersgill from Perfect fit for Sony XDCam F330 Very well padded, keeping my F330 very safe during travel. The two zippered pouches on the back allow me to bring up to 4x XDCam Professional Discs with me at all times. The front left pocket easily holds my tripod plate, and the front-right pocket holds two additional Dionic-90 bricks and still has enough room to squeeze in a set of Sony headphones. One final note, I am able to store the camera in the case with the lightweight rails attached, but I cannot store it with the mattebox on. Rated 4 out of 5 by Visicor from Great Case Bought this for my Sony EX3 specifically to take carry-on airplanes. Had no trouble this first trip, but the bag will not stand up straight in the overhead bin (had to lay it on its side). The viewfinder pocket is a little small for the EX3 (have to flip the rubber eyepiece around), but it fits. Best part is it protects the camera, holds all the gear and has a comfortable strap. Rated 1 out of 5 by Grant the cameraman from Not the case for me. I use my product to carry around my eight thousand dollar camera. The case is to big for the camera. There is nothing redeeming about this case. I purchased the wrong case although the instructions said it fit the camera. That is absolutely not true. By the way I use a Sony EX-3. The case is about eight inches to long for it. I'm in the process of sending it back. Rated 5 out of 5 by weavervideo from Really Like Porta Brace I am really happy with my Porta Brace carry on case. The camera fits snugly inside and this particular case is small enough to carry around without any hassle. Construction quality is very good. I really like the addition of black material to the Porta Brace line. Rated 5 out of 5 by tnutwo from Got me where I need to be Great product! Good use of space w/pockets and protected the camera well. Went threw airports, buses and taxi cabs; came back in one piece. Shoulder strap is also comfortable. Rated 5 out of 5 by Anonymous from Typical Porta Brace high quality Typically high quality Porta Brace product. Strong, well padded and built to last. I fully expect this bag to last as many years as my previous purchases.